A perceived need for well-funded mass transit has Wisconsin labor, environmental and road building groups in agreement. Some Regional Transit Authorities could be established if the state budget were to pass in its current form. The coalition supports budget language which would allow Wisconsin communities to form RTAs with the authority to levy a sales tax of up to five tenths of a percent. At the Capitol for Public Transportation Day, Jeff Van Koningsveld of Racine, with the International Brotherhood of Electrical Workers , says they’ve found common cause with environmentalists. “We’ve been adversaries for a long time,” Van Koningsveld noted, noting past disagreements over coal-fired power plants in Wisconsin. Now however, he said union members are looking forward to a partnership with environmental groups, one that would see electrically powered light rail projects developed across southeastern Wisconsin. Wisconsin roadbuilders are also on board with the need for RTAs. “Major corporations in the state have really come to the forefront on transit as well, because they’re seeing it’s very important to their bottom line,” said Craig Thompson with the Transportation Development Association . “Our lack of having connections through transit is hurting us, I don’t think there’s any question about it. 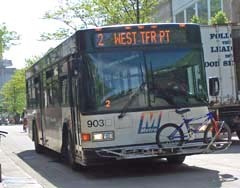 The coalition’s website has more information on regional transit authorities.